Manufacturer of a wide range of products which include bsp taps. We are engaged in offering a wide range of BSP taps. These tools are used to make a thread in inner part of the hole, which creates a surface that work as a Pipe fitting parts. These BSP tap are made with the HSS metals such as good quality of steel and cubic boron nitrate. 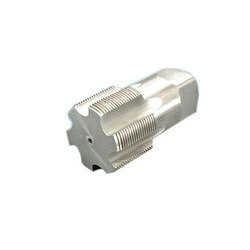 Known for its superior quality, these short BSP tap are manufactured using best industrial conditions.